As Maria Montessori knew to be true, an early mastery of language is the basis of all academic success. Understanding how to form, speak, write with, and use the correct words in context so often determines the way students move about not only their school days but their entire academic careers. While the preschool and elementary years represent a time for rapid intellectual expansion, many non-Montessori curriculums are simply not built to match the speed at which young minds are growing. As a result, children end up frustrated and confused, resisting instead of falling in love with the art and pleasure of reading. If parents and educators don’t help children get off to a solid start with literacy, grammar, and even basic motor skills, students face a very real risk of falling behind in agility – even if their intellect and imagination possess a strong ability to do the work itself. 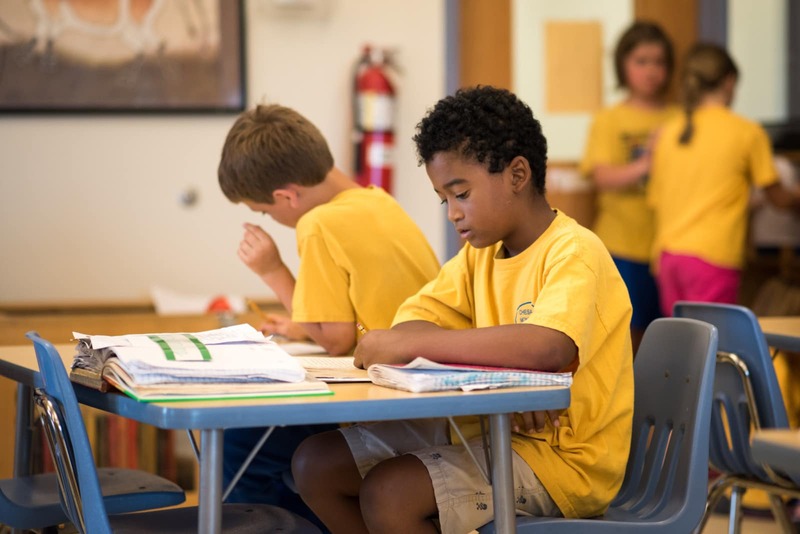 At Chesapeake Montessori School, our teaching staff pours its energy into making sure that students have an ally and advocate in the process of learning the core facets of language. On the cusp of each new school year, we meet to take stock of what’s working, what’s not, and what we can do better to match the needs of our students. These constant improvements in our curriculum are part of what makes our students so successful, and why parents are so thrilled to see their children writing and reading with ease. Before we teach children to write, they trace the letters of the alphabet using sandpaper letters. This gives them a multisensory aspect and creates muscle memory for when they begin to write using a pencil. We then use a movable alphabet to help them learn to encode or spell. Meanwhile, students work on all kinds of activities to strengthen their hands and learn a proper pencil grip. One of the ways Montessori excels at introducing reading and writing to children is by focusing on proper penmanship. We regard this as so much more than just an everyday skill; we treat this as a life skill that goes hand-in-hand with literacy. As digital tools have replaced most needs for handwriting, Montessori schools still focus on legibility as the basis of all learning. After all, there’s nothing like being able to express thoughts in a journal, sign a ‘thank you’ note, or fill out an important document by hand. When teachers and parents help young students properly decipher the differences between words and letters, learn their pronunciation, and ultimately understand their meaning in the context of sentences, we empower them to become comfortable with – not intimidated by – the words that they’re destined to meet in their educational future. A great example of this is how we introduce penmanship to preschool students. Chesapeake Montessori students aged 3-5 get an early start with the basics of cursive. Instead of treating cursive as something to aspire to after learning how to write the alphabet in traditional print or block script, we follow children’s developmental habits. As students at this age are eager to scribble (much to the dismay of parents with white walls! ), our teachers spend a significant amount of time helping them understand the way, for instance, how writing a ‘p’, ‘d’, or ‘b’ feels. By starting in preschool and continuing through the 3rd grade, we’re able to not only clear the confusion for how these letters are formed but gradually introduce how these letters are phonetically pronounced, avoiding confusion once it’s time to begin reading. Language is treated with the utmost importance in the Montessori classroom. Our teachers start with a phonics-based approach to learning the basics: sounds, vowels, and consonants. For preschool students, this also means learning through sight words and sounding out sentences through consistent practice. In the lower elementary years, our students are heavily focused on grammar. Whether you loved or loathed grammar as a youngster, we believe it remains one of the most critical components to a successful early education. This isn’t meant to frustrate, but rather to form the foundation of literacy while encouraging young minds to stretch in the direction of new learning pathways. The way we see it, language and grammar are a lot like math and science; it follows a certain set of rules, it behaves in predictable ways, and it requires civil conversation to reach the best conclusion. 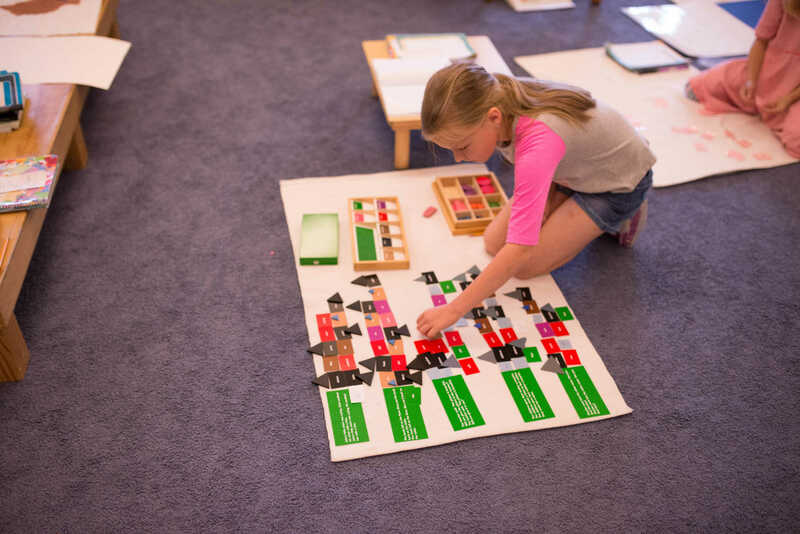 Our elementary students are challenged every day in the Montessori classroom. In early elementary, we start with the basics, like parts of speech (adjective, article, noun, verb, adverb, preposition and conjunction). Later in upper elementary, we continue with the more detailed elements of what students already know, such as the four types of adverbs, seven types of prepositions, and six types of adjectives. Our teachers help students understand how these pieces of grammar are used in context through several methods: sentence symbolizing, which is identifying parts of speech and functions of words by drawing shapes over them, and later, sentence diagramming, which is analyzing the subject, predicate, and modifiers at hand. All of these grammar skills ultimately reach a tipping point in the later elementary years, when we put everything together and begin to enter the mechanics of punctuation, and more holistic perspectives on language based on contextual use. Whether you loved or loathed the process of learning grammar as a kid, we’re on a higher mission: to introduce the secondary skill set of civic debate that makes this process so worthwhile. 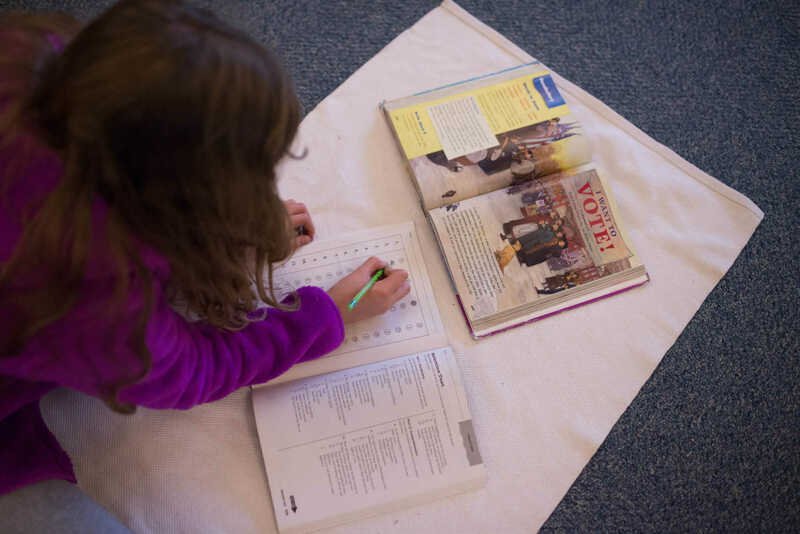 As teachers guide and moderate discussions about singular, plural, or indefinite pronouns, students also learn how to participate in the many “puzzles” of grammar, thereby expanding their capacity for dialogue, reasoning, and debate – skills that no doubt prepare them for life outside the classroom. Learning language and learning how to read happen concurrently at Chesapeake Montessori. Beyond helping children learn how to read, we’re very much focused on helping them understand why they should read in the first place. Our classrooms instill a love of learning, a sense of imagination, and a sense of pride that comes with not only mastering the skill of reading, but enjoying the process of picking up books for sheer pleasure. Reading is formalized instruction time that happens weekly within our elementary classrooms. Using a combination of “readers” from Scholastic Reading Counts and similar publishing houses, these readings are tailored to appropriate age, skill level, and interest. While we recognize that some of our students are eager to read books that are at an advanced level, we know that more advanced books come with more advanced subject matter – some of which children may not be ready for quite yet. 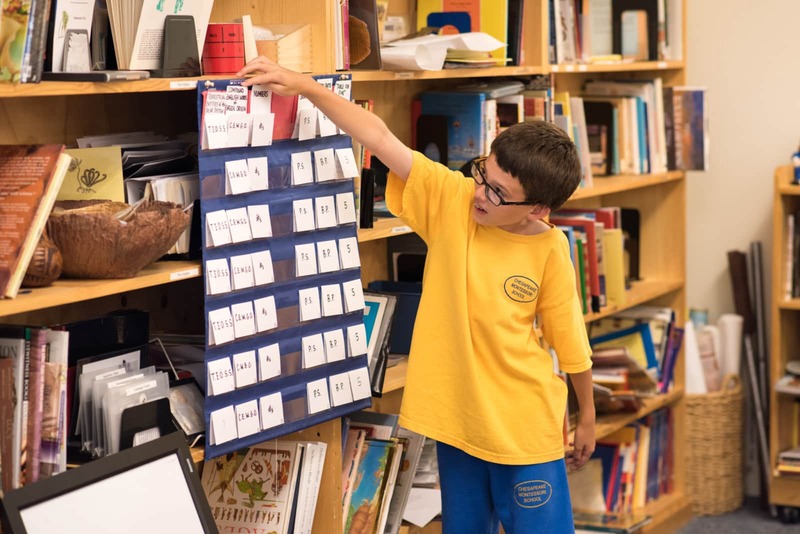 Additionally, while students may be ready for deeper reading, they may not have the comprehension skills – such as prediction and inference – to match quite yet. 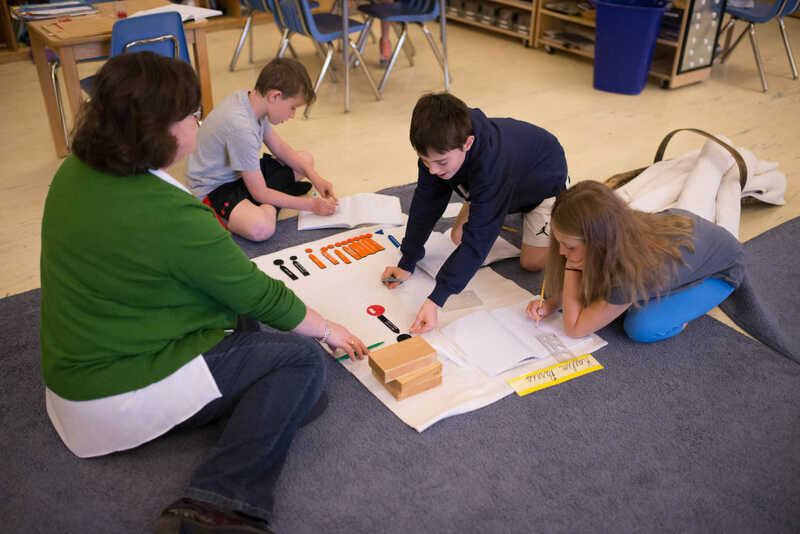 For this reason, Chesapeake Montessori’s expert teaching staff manage, implement, and pivot customized curriculums each year, based on students’ individual needs, and classroom readiness for next-level reading. Our goal is to not only stimulate, but satiate, students’ expanding literary minds, so that they may learn to embrace reading as a both a practical skill set and an enjoyable activity that they can carry with them through life. Novel studies are intensive studies that take place within the school day. A combination of reading, writing, discussion, and wordplay, this part of the school day is designed to stimulate the skills of conversation and conjecture. We ask students a variety of questions to get the wheels of comprehension turning. What do you predict will happen next? Why do you think the author did that? Which character is your favorite so far, and why? By encouraging discussions around storylines, characters, and plot points, students are able to interact with books and their narratives as an insider, instead of observing them as an outsider. Whether it’s discovering the historical fiction of the Powhatan Indians through Blood on the River, devouring all 15 books in the Guardians of Gahoul series, or bearing witness to an incredible story of survival in Island of the Blue Dolphins, we always try to mix genres and series from year to year, keeping students hungry for more. Book clubs are used in school and as after school activities that make our favorite hobby feel like a party! Designed for bookworms ready for more, our teachers and students work together to choose the next book for the club. We also inspire students to bring in snacks that pair with the storyline, sit with friends, and dive deep into the book’s pages. Last year, our book clubs had a lot of fun with the young reader’s adaptation of Three Cups of Tea, and of course, learned to brew the perfect cup as they made their way through each chapter. Parents of Montessori children are always curious: how does the school handle grading, report cards, and teacher feedback? In the preschool and lower elementary years, our students take home narrative report cards. This is where teachers are able to explain, in great detail, where students are progressing, having difficulty, or haven’t been introduced to certain topics yet. We do this so that parents can get detailed account of their child’s progress in the classroom, and learn more about where they can support students at home, outside of their regular school day. 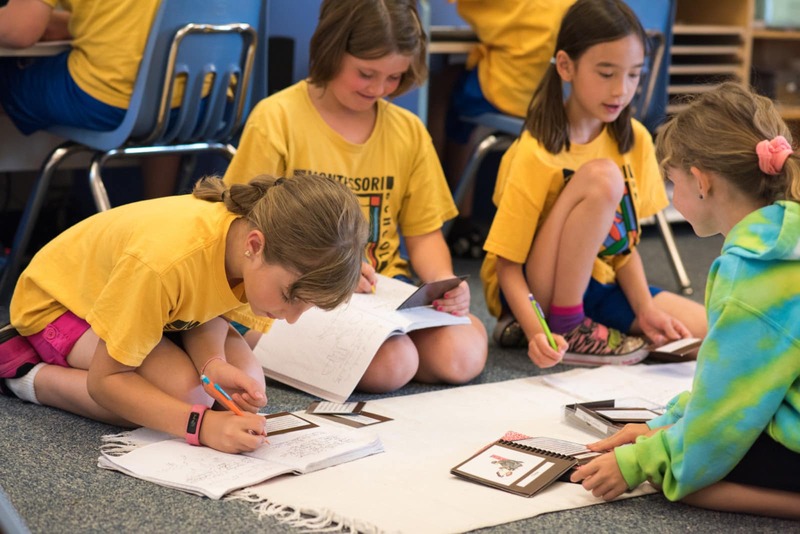 As students climb to the upper elementary years, we begin grading four areas: math, history, language, and science, as well as a narrative component. We made this decision not only to help parents understand student progress, but to help students become aware of their own learning. Beyond any grading system is the most important ingredient to academic success: effort. After all, effort – and how it’s earned based on how carefully and thoroughly work is completed – is what we’re looking for in our classrooms. When students’ effort is matched by effort put forth by parents and teachers, success in penmanship, grammar, and reading is inevitable! We’re hosting our annual Open House on February 4 for parents of children 3-12. If you’re interested in learning more about our Montessori school and how we use traditional methods to instill a love of learning in our students, please join us anytime 10am-12pm. We’d love to meet you and learn more about your family! You can get more details and RSVP through our Facebook event.